Replacing the first Boxster in 2006, Porsche's mid-engined roadster grew up a bit in its second (987-model designation) generation. Replacing the first Boxster in 2006, Porsche's mid-engined roadster grew up a bit in its second (987-model designation) generation. It was produced from 2006 to 2012, when it was replaced by a new model. Porsche might be best known for its 911, but the Boxster is arguably one of the best sports cars the company produces. Its mid-engined layout makes for perfect balance, its simple lines are timeless in style, and to drive it's among the most enjoyable, exploitable sports cars money can buy. Ignore the poor man's Porsche gibes, and instead enjoy something of a performance bargain. Porsche doesn't really do radical when it comes to design, instead sticking to a proven formula and finessing it over time. 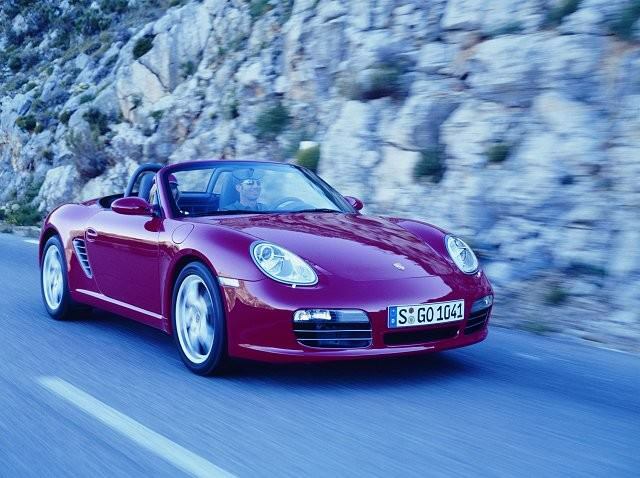 That's obvious with this 987-series Boxster, which is clearly derived from its 986 predecessor. Like the 911 Carrera Porsche offered the Boxster in two guises, the standard Boxster with a 2.7-litre flat-six engine, or the 3.2-litre Boxster S from 2006 to 2008. After that the engine line-up was revised, with a boost in output and capacity, the standard car growing to 2.9 litres and the S 3.4 litres. Even the earliest 2.7-litre cars offer excellent performance, the 240hp unit able to propel the Boxster to 100km/h in 7.1 seconds. The S drops that to 5.5 seconds, thanks to an extra 40hp. The bigger engines from 2008 saw the 2.9-litre Boxster develop 245hp and the 3.4-litre S 295hp, those outputs upped in 2009 with the facelifted Gen II Boxster to 256hp and 310hp respectively. The later, post-2009 cars were also offered with Porsche's twin clutch (PDK) automatic with seven gears, replacing the older Tiptronic automatic transmission. Manual choices include five- and six-speed manuals on the standard Boxster, and a six-speed unit on the S.
The S gained more equipment as standard over the regular Boxster, but rarely are two cars the same thanks to Porsche's extensive options list. All will have air conditioning, an electrically powered roof and windows, desirable options being PCM (Porsche Communication Management), iPod connection, sports seats and a wind deflector. PASM - Porsche Active Suspension Management - is also often on the spec sheet, it giving two damper settings - though the standard suspension is far from lacking. A few specials were produced, the rare Spyder losing the conventional roof and being stripped of any superfluous weight for a purer driving experience for instance, while Porsche also offered design edition and RS60 Spyder editions in its production run - these were low number models with unique equipment and liveries. Performance is never lacking in any, but focusing on the raw numbers is rather missing the point; the Boxster is all about how it drives, not necessarily how fast it is, the precision of the steering, the feel it delivers and the response it gives. It really is a wonderful car to drive - at any speed. There's no bad model in the range, so your choice dictated by what you want to do with it and your budget. The standard cars are fast enough, the S more ferocious but not so different in the fun stakes to the lesser powered models. Manual gearboxes are more involving, the early autos arguably the most disappointing, later PDK autos improved if you prefer two pedals. Given the choice, we'd have a later 3.4-litre manual S, as it's just about perfect. The Boxster is a fantastic sports car that, while the entry-point to the modern Porsche family, doesn't feel like a poor relation. Indeed, the Boxster's inherent balance makes it arguably the finest, most enjoyable of the company's sports car range. Just don't tell anyone, as prices remain relatively cheap for this brilliant car.